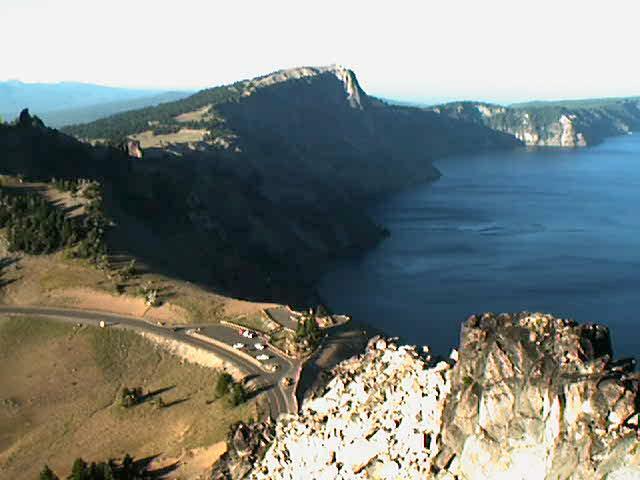 Crater Lake occupies the old caldura of Mt. Mazama. About 7,700 years ago, Mt. Mazama had a huge eruption. It blew and it blew, so much volcanic ash that much of the Pacific Northwest was blanketed in the silty fine stuff. Native Americans were living at that time and the stories of the eruption, that they have passed down, are surprisingly accurate after all those thousands of years. See more at bottom of page. The eruption was so massive that it exhausted all the hot material in the caldura under the mountain. This caused the massive mountain to fall in on itself leaving a huge hole in the ground. 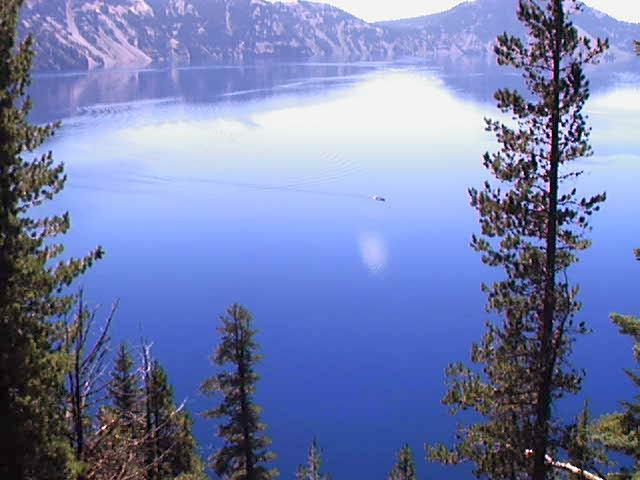 This hole is now filled with the deepest lake in North America; Crater Lake. Its water is very pure and all preserved in a national park. The lake has no visible outlet, from the surface, but water leaks out into underground springs. The springs feed the north fork of the Umpqua River. Deep blue waters of Crater Lake. From Highway 58, I took forest service roads (mostly gravel) over Windigo Pass and dropped down to Diamond Lake. This was during my year 2000 bicycle loop in Oregon. Camping at Diamond Lake was great. Free bike sites at the forest service campground and a big lodge nearby for meals. Crater Lake was an all day trip from my camp at Diamond Lake. One steep trail heads down to the lake shore. Buy your boat tickets at the top if you want the ride. I decided to do the boat tour. 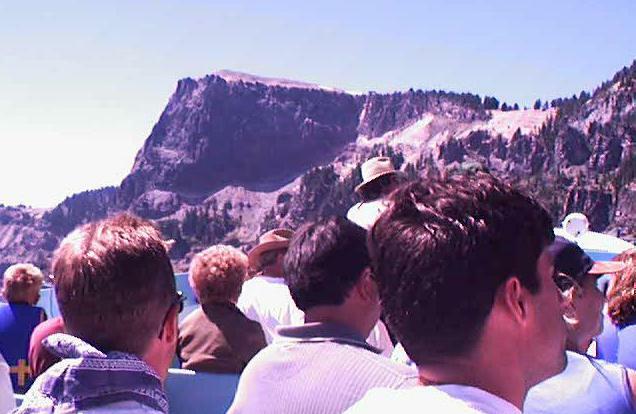 As the boat heads around the lake, a guide explains much of the history, geology and indian folklore of the area. Photo passing the Phantom Ship, one of two islands in the lake. 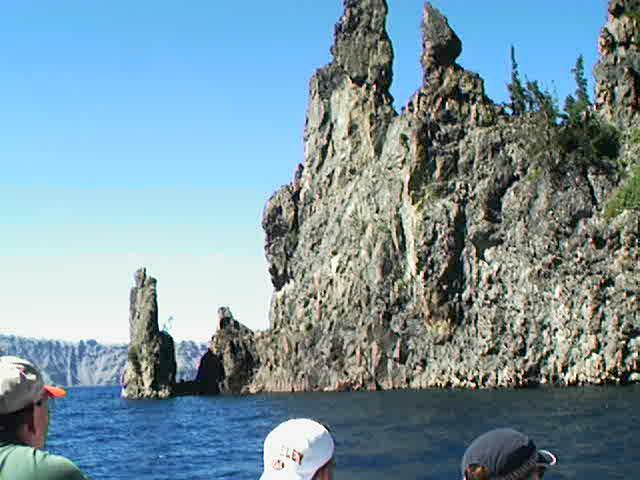 The Phantom Ship is a volcanic dike, that was part of the original volcano. As the mountain collapsed, part of the hard rock of the dike remained jutting up into the air among the ruins of the collapsed mountain. Now this portion of the dike is an island. 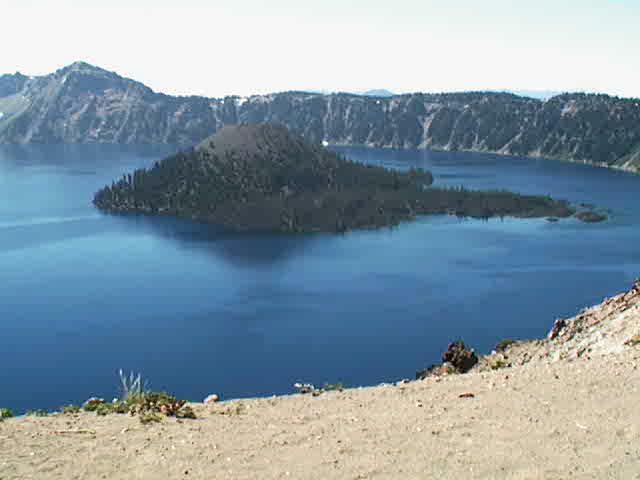 Crater Lake's other island is called Wizard Island. It is a cinder cone caused by some "last gasp" eruptions after the mountain collapsed. View from a trail high up along the rim. I didn't ride all the way around the lake (22 miles) as the road is fairly busy in summer. Instead I stopped at a few points of interest on the north side. 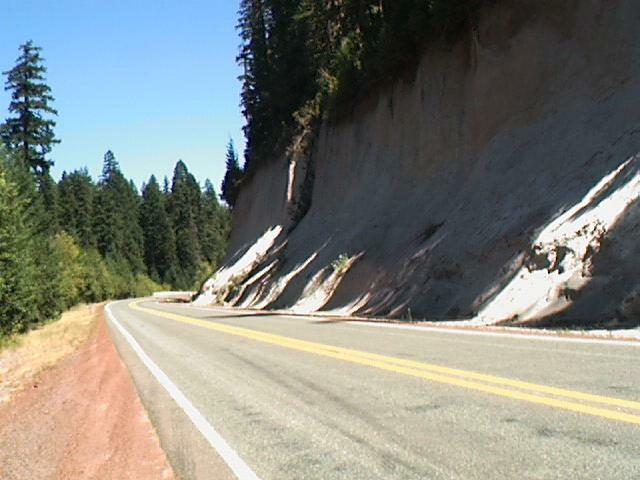 Road cut along the Umpqua River showing the deep mazama layer. The ash is quite deep, near the lake, but evidence of the silty white mazama layer is visible over much of the northwest.